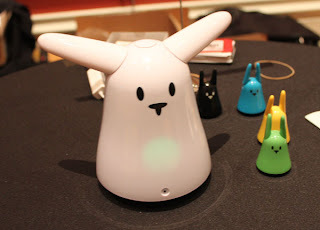 Karotz, the shape of the robot is very cute, like a rabbit. Moreover Karotz robot is equipped with various facilities which makes it even more adorable. The first robot rabbit can be used to monitor the situation at home became a kind of remote CCTV because there is a webcam on the robot. In addition, the robot is also able to provide information weather forecasts, sports, RSS Feeds, music, twitter and others. 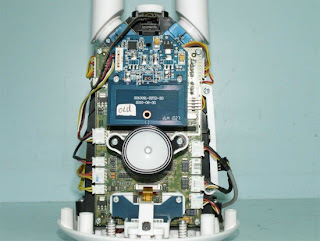 In addition there is also RFID scanners in this smart robot rabbits. In fact we can listen to MP3 music, Internet radio, podcasts of the robot. An interesting feature of this robot is Karotz to Karotz. The facility is using VOIP to call other Karotz. In addition to VOIP services, Karotz can also be integrated with a smartphone. In addition there are additional apliaksi applications that can be installed on the robot is easy as buying the app store only. The Karotz Price: 199 USD.